There by the sea sings the sweet Mermaid. She can calm the air with one of her lovely laughing smiles. He who looks upon her beautiful face remains a prisoner of love. He who beholds her fair light is forever heart-bound to her. 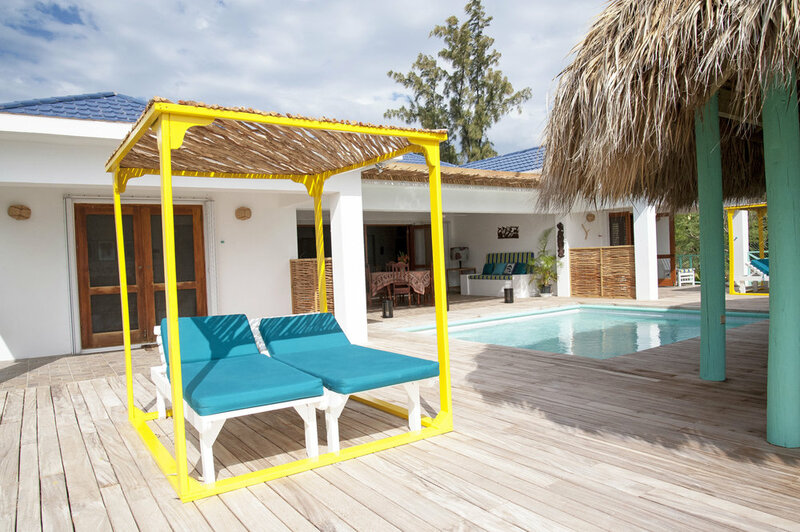 La Sirena -- The Mermaid -- a dream of a holiday house for 1-8 guests. 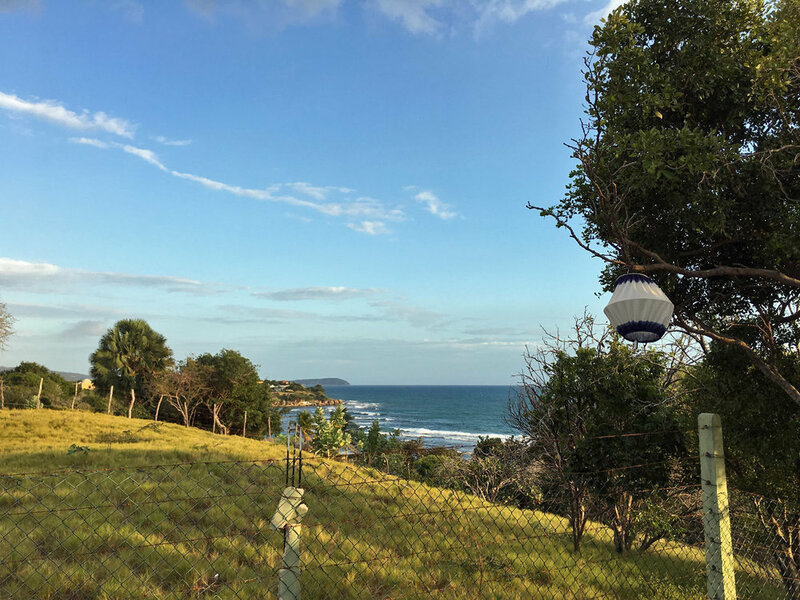 Privately perched unseen on a bluff overlooking the ocean and 3/4 mile long Billy's Bay beach, which it shares with local fishers and only 6 other villas. 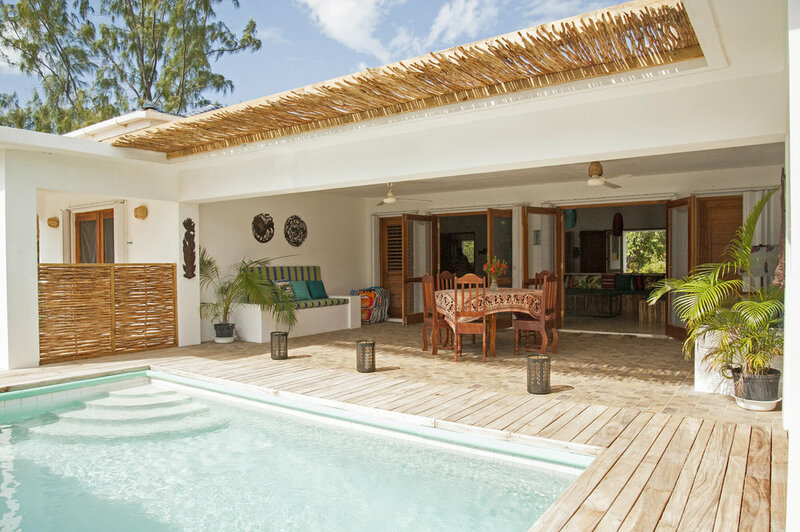 Two king size bedrooms with en suite bathrooms in marble, white- stone, and tile also open up through French doors to the pool, deck and tikki hut with sea breezes and sunsets. A third large bedroom with a queen size bed, one single, futon and private bathroom. Two singles bedrooms were added in the fall 2016 which share the bathroom that is located in the spacious, green-tiled kitchen, plus ceiling fans are throughout the property providing a great breeze. La Sirena is built in a minimalist Palladian style -- all pure, gleaming white with bamboo accents. 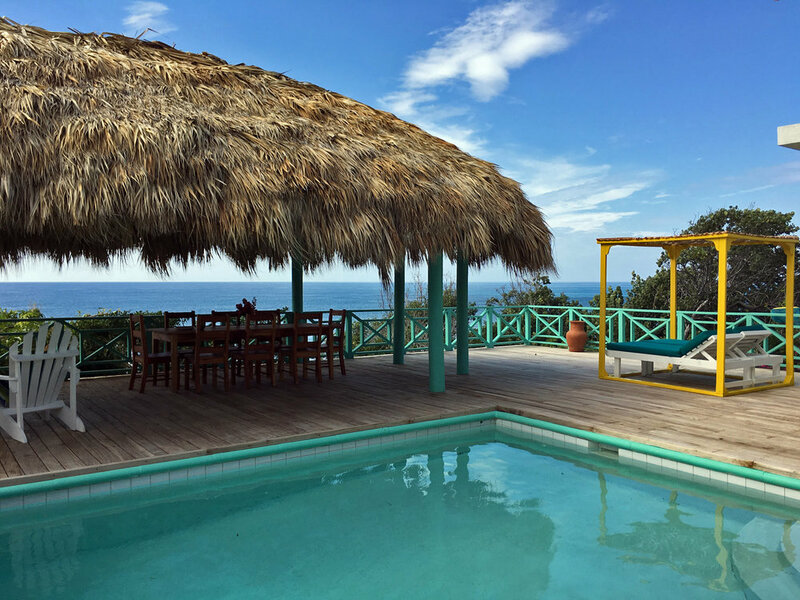 A huge central living room with built-in bancos (banquettes) opens out through mahogany-stained cedar French doors to a covered patio and terrace with plunge pool, deck and tikki hut -- with views all the way down the coast to Pedro Bluff. 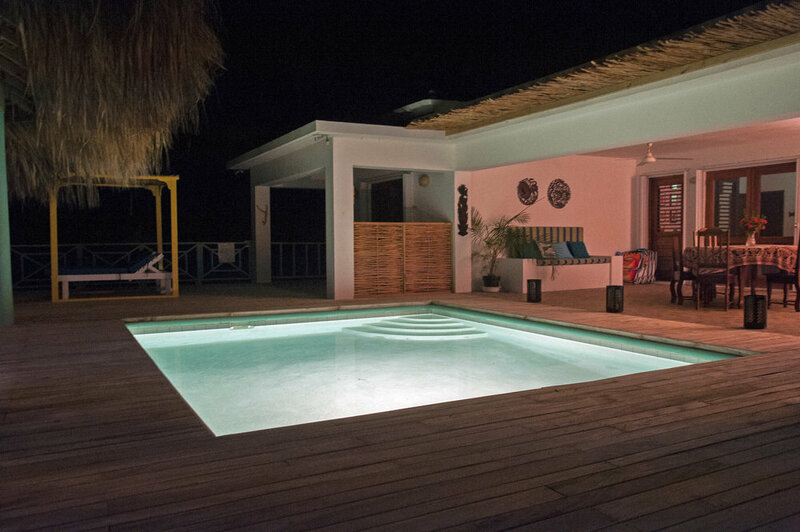 The villa is also wheelchair accessible from the side of the house via the deck, pool/terrace area and throughout the house. Botanical gardens are planned to showcase the villa with a collection of traveler's, chinese and royal palms, agaves, and specimen aloe & cacti. La Sirena is set off the country road in Billy's Bay, a peaceful, quiet area -- a 7 minute drive or 20+ minute walk to Calabash Bay, restaurants, local shops and bars. UAN, MISS IDA'S son, is La Sirena's PPV insure driver and he can be hired for airport transportations as well as touring by land to YS Falls, Bamboo Alley, Appleton Rum, Pelican Bar, Black River, Little Ochie, Milk River Bath, Lover's Leap, etc.. Rentals of bikes and scooters are also available. If boating is what you desire, MISS IDA will help arrange for a boat guide to Pelican Bar, Black River Safari and/or fishing trips. Bedrooms: 5 breeze ceiling fanned bedrooms. Air-conditioning in bedrooms 1-3. No charge for age 2 and under. Please inquire for longer term rentals and cancellation policy. MISS IDA HILL, MONICA and SHEP have worked at La Sirena since the property opened. Miss Ida is the property manager and main cook, her daughter Monica, is the housekeeper/second cook and her son, Shep, is the villa caretaker/gardener. "La Sirena exceeded our expectations in every regard. The house suited our family of 10 perfectly. From kids to adults, everyone was happy. Miss Ida and her crew took great care of us with amazing prepared meals. We enjoyed getting to know her family while there. We typically had the beach to ourselves, with the exception of a few other happy tourists or the local fishermen. The pool was the perfect size for the kids or for a quick dunk after hitting the beach. 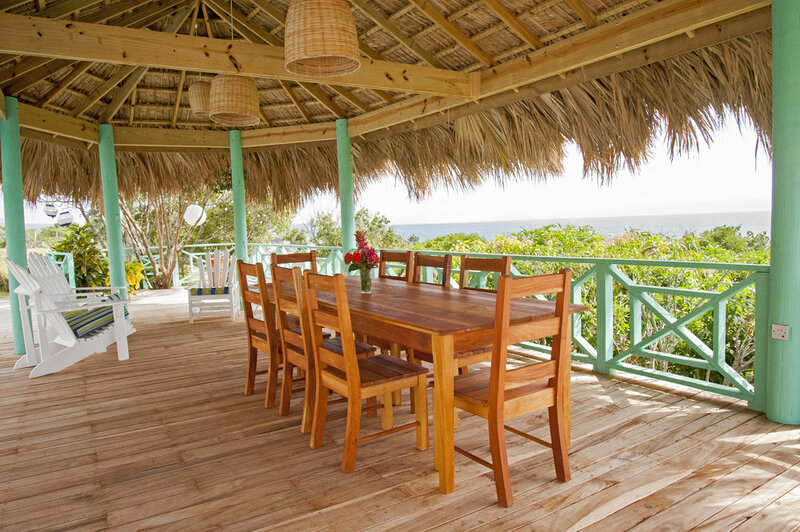 Treasure Beach is a lovely laid-back community with friendly locals. There are plenty of excursions available, but you will likely want to hang out and enjoy La Sirena as we did!" 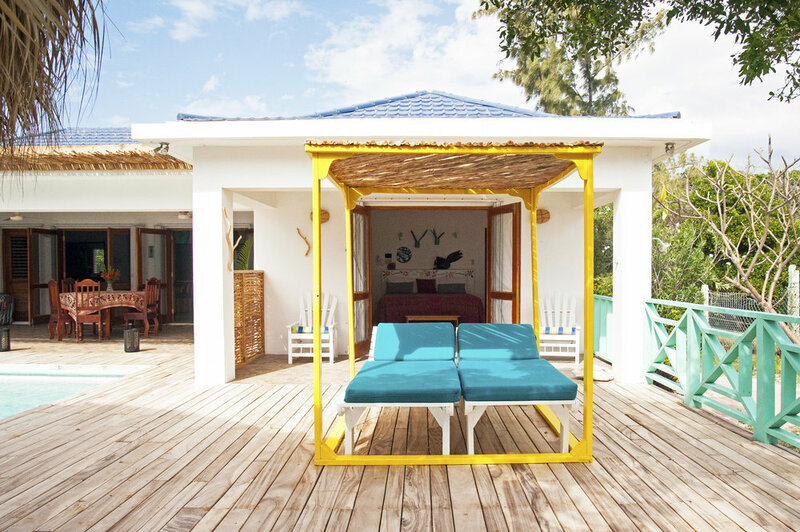 "We have just returned from Jamaica where we had a truly superb stay at La Sirena Villa, Treasure Beach. This is our 6th trip to Treasure Beach, but previously stayed at Jakes Hotel and fancied a change. Uan picked us up from the airport and took us to the villa and what a nice surprise when we arrived to be greeted in the floral front garden by Miss Ida and her daughter Monica who had a lovely meal waiting for us. Our rooms were well appointed with an ensuite bathroom, air conditioning and comfortable beds (there are also two smaller rooms which share a bathroom off the kitchen). The spacious lounge had ample seating, a sound system, television and WIFI that had a good range. Breakfast was also served under the Gazebo where we had a beautiful view of the ocean and wall to wall blue sky. The pool , which was surrounded by decking, was very clean and proudly maintained by Monica's brother Shepherd who also maintains the garden. All of the staff are very friendly, helpful and knowledgeable about local flora and fauna. I had some interesting chats about birds and butterflies - both of which were plentiful in the gardens. A short walk down the garden took us to the beach with beautiful golden sand. 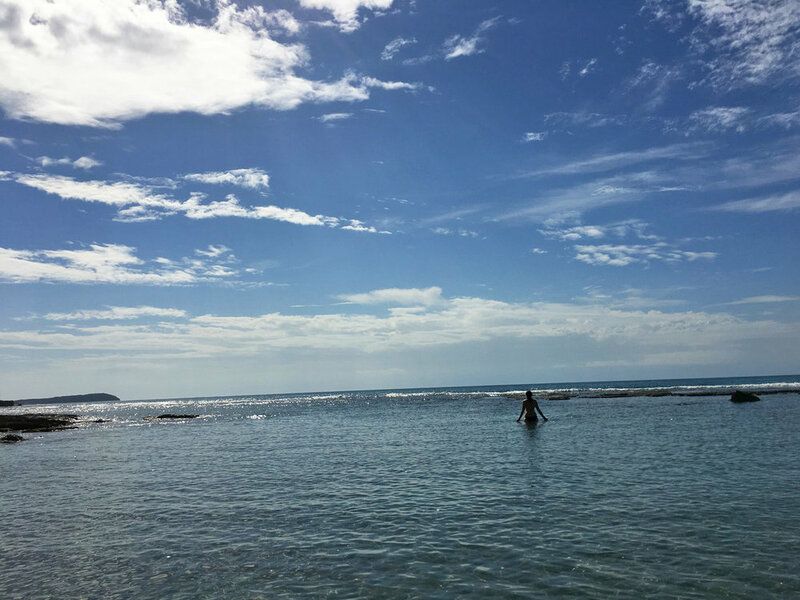 In the sea, there are some patches of rock, but there are large areas for safe bathing (to the delight of our grandson). A short walk from the property, are a number of small bars where you can sample local cuisine or just a red stripe (local Beer). We found the locals were extremely friendly and happy to chat if you wanted, or just say 'hello' if you didn't. 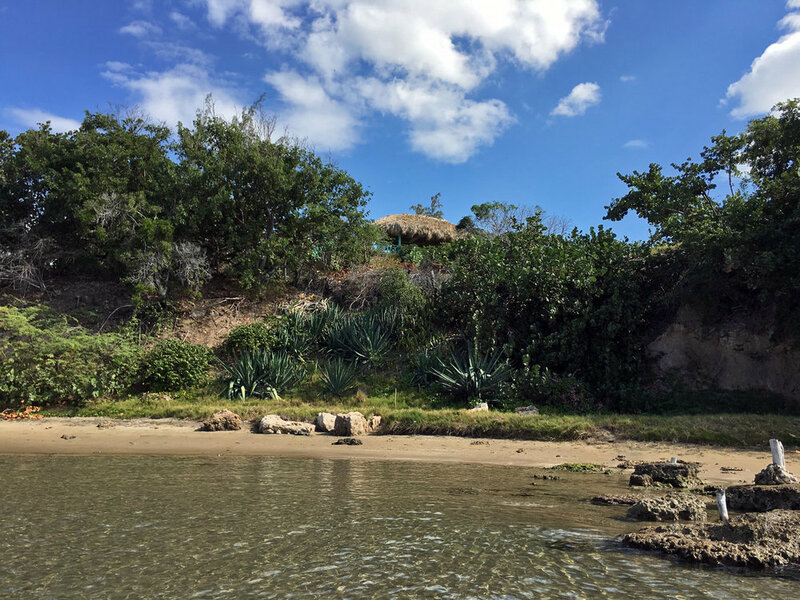 We booked some boat trips via 'Captain Dennis' who took us to Pelican Bar, Black river and a small beach for lunch, which he cooked on open fires. The villa was comfortable, with plenty of sun bathing area on the decking, and shade under the gazebo. The dining experience was amazing. Miss Ida gave us such a variety of food, and was happy to cater for all our special needs (lactose free, spicy, non spicy etc.) and stocked up with wine and beers before we arrived. Our diet starts now and we are saving for our return to La Sirena." 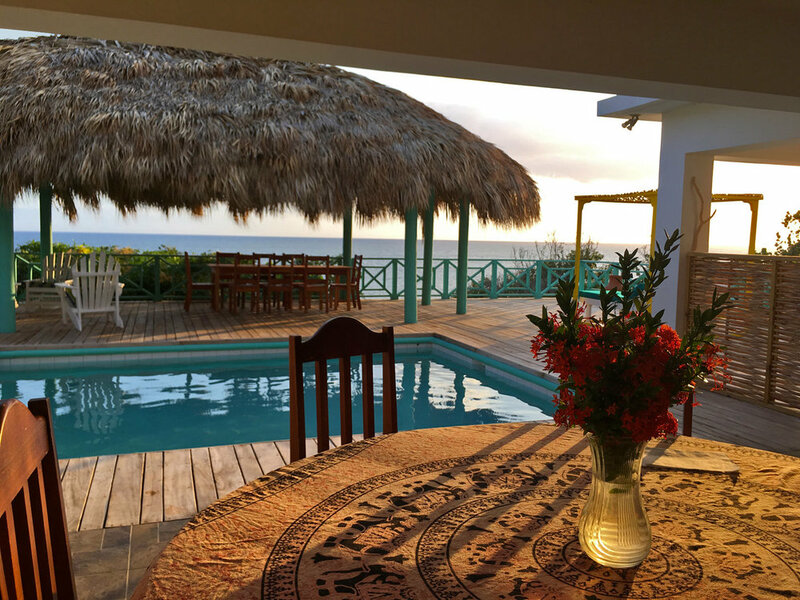 "Just got back from a 7 night stay at La Sirena and it was absolutely amazing!! Ida and her staff are fabulous!!! Could not say enough great things about them!! They greeted us upon our arrival, made us feel comfortable and right at home!! Ida would make us breakfast and dinner. They did not serve lunch, but they had food for us to eat. The food was delicious!! We had authentic Jamaican meals everyday!! We had a huge basket of fresh fruit that we were able to snack on and also had as part of breakfast. Shep, Ida's son came every morning to clean the pool and water the plants. He was very nice and would spend some time talking to us! The view is awesome! We saw some amazing sunrises and sunsets! There is hill that you do have to walk down to get to the beach but it is definitely worth the hike!! The beach is a little rocky but you can swim in it. We spent a lot of time in the ocean and down on the beach. It's a small beach, less than a mile, with a few villas but very rarely did we see anyone. It was like having the beach to ourselves!! Midway down the hill, there was a sunset deck. It was a great place to watch the sunset!! It was great talking to the staff and learning about their culture! 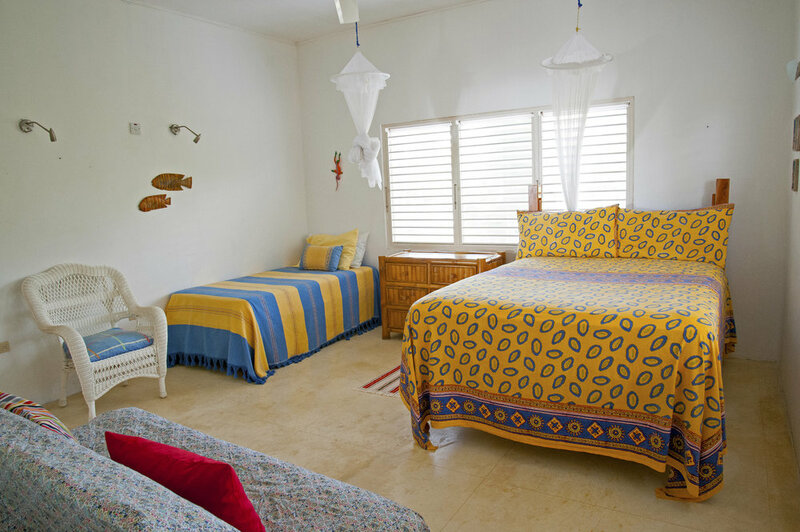 It was a beautiful, relaxing place with excellent staff and made for a great vacation!!!" 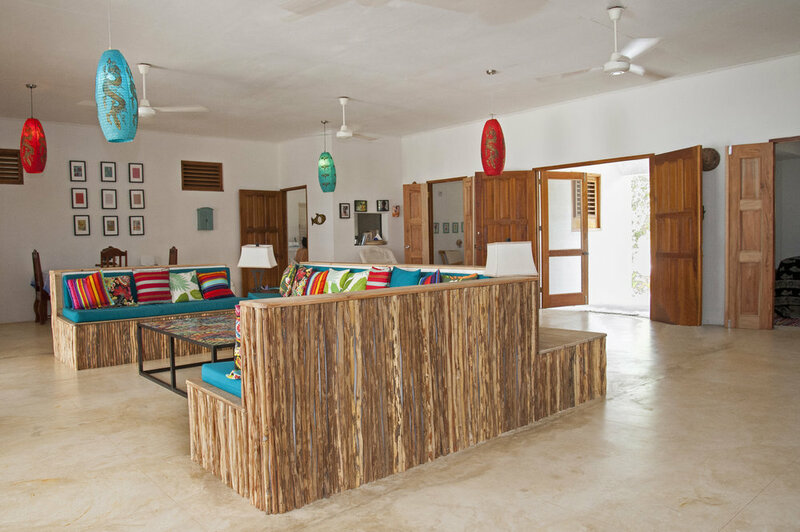 "Just returned from a weeks stay at La Sirena and could not have been any happier with our choice. Having been to Jamaica before, always on the North Coast, we wanted something different out of this trip to Jamaica. At La Sirena, that is exactly what we got! Miss Ida and her crew were such a pleasure to be around! We were a group of 5 (ages 27-31) and felt completely comfortable with them. Loved her food and they were great to sit and talk with! They make this villa even more special!! The villa -- As for the villa itself, it is located at the end of Treasure Beach. It sits up on a hill directly above Billys Bay. The pool is a little bigger than it looks in pictures. You will not be swimming laps but it is enough to get in and cool off. The Beach is amazing! If you want to venture out into the community, there is a store about a minutes walk from the villa (The South Pole). They have everything from rum and red stripe to toothpaste. There are also plenty of Jerk spots you can walk to. The beach -- A stretch of beach that runs about 3/4 a mile that you share with maybe 4 or 5 other villas, and a few locals who dock their fishing boats at the far end of the beach. There is a path with steps at the very bottom to get onto the beach (not a terribly long path but is kind of steep and does require around 10 stairs at the bottom). We loved the beach! My wife and I would take a walk every morning for sunrise. We might have seen 5 or 6 other people on the beach. It also offered gorgeous sunsets! Treasure Beach is definitely something special. A small fishing a farming village, it is the exact opposite of most tourist destinations in Jamaica. Not the hustle and bustle that comes along with an Ocho Rios or a Negril. Certainly not the vendors and peddlers you get taking a stroll down 7 mile beach or walking the "strip" in Mo Bay. Just a small community on the South Coast of Jamaica, quite and secluded. An absolutely wonderful place with wonderful people!" 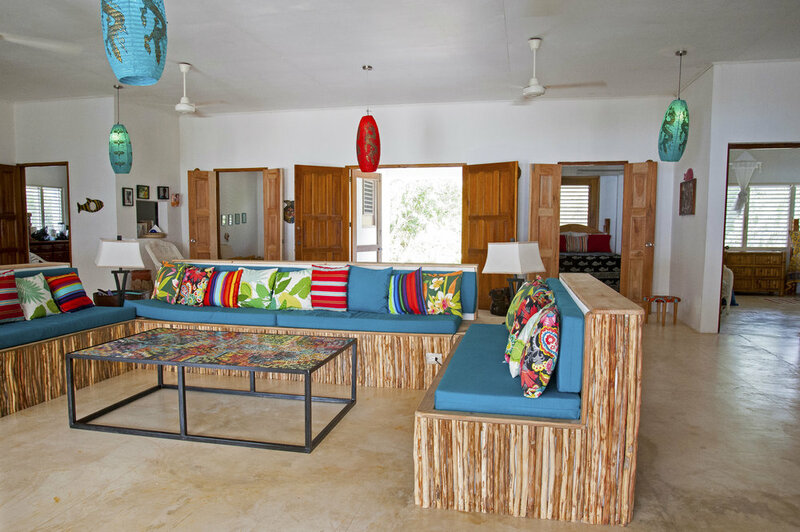 "My mom and I stayed at La Sirena for a week in June for our first trip to Jamaica. It is difficult to find much info on this villa, so hopefully this will help: Check in: You just show up and they are there to greet you. No key pick up, nothing. And your fridge is stocked when you get there. Location: It's near the end of Billy's Bay on a dead end street. It is very private and cannot be seen from the street. It is gated and has a circle drive with an amazing garden. Within a 3-5 minute walk you can get to the area of Billy's Bay where the fishing boats come in; to South Pole which is a small convenient store-- and it's common to see locals playing cards there; Strikey T's restaurant which is closed during the summer; Desireen's cook shop called "Lykkle Diamond" which has awesome daily specials; Villa Elegance which has Karaoke on Wednesday nights. The area is completely safe. My 67 year old mom and I (38) walked back to the villa after midnight after karaoke joined by a few local kids and could not have felt safer. It is fairly remote and transportation is not as easy as I had hoped. Walking to Jake's is possible but it's a LONG walk. Bicycles would work but part of the way is up hill. Find a local driver, get his cell # and call him when you need transport or use the route taxi - which doesn't come around very often. 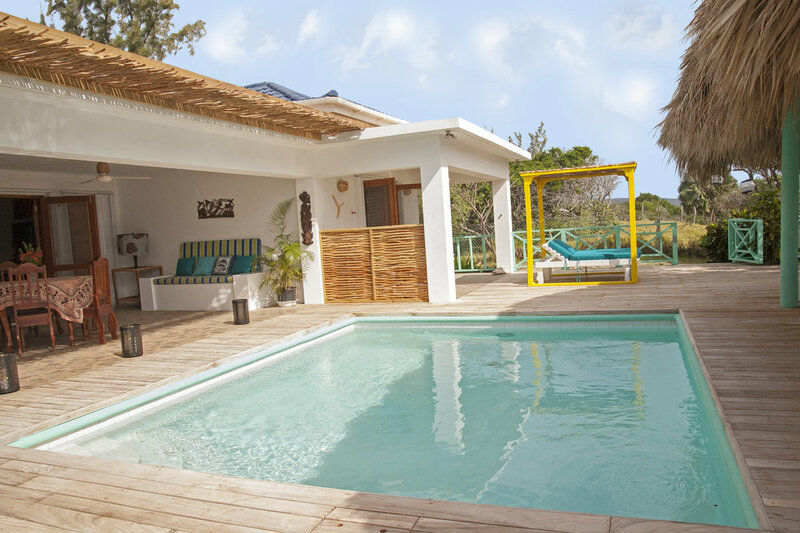 Bedrooms: I picked La Sirena because two bedrooms opened out onto the pool area and had ocean views instead of the usual villa with one bedroom far better than the others. We made the right choice!! 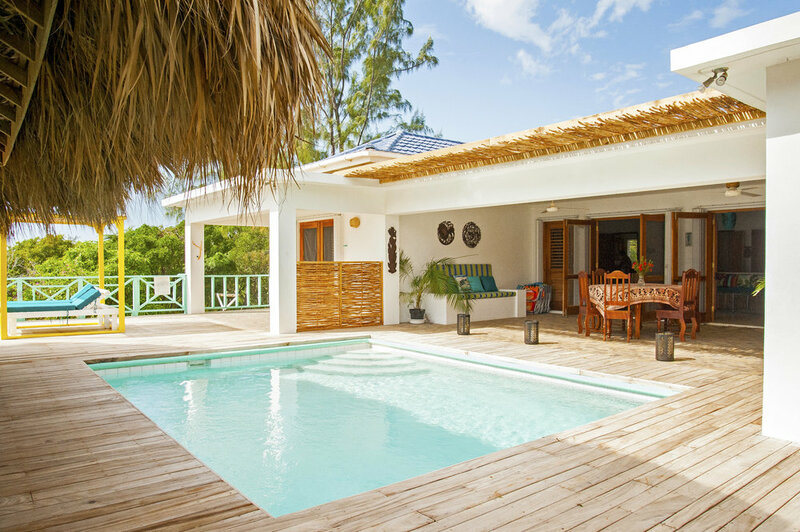 The villa has 3 bedrooms- all 3 bedrooms and adjoining bathrooms are identical except: two have doors that open out onto the sea/pool and have king (or queen) size beds and the third has twin beds and a beautiful garden view. The beds were super comfortable. Accessibility: The house seems to be fairly accessible, there are some stairs up to the front door. 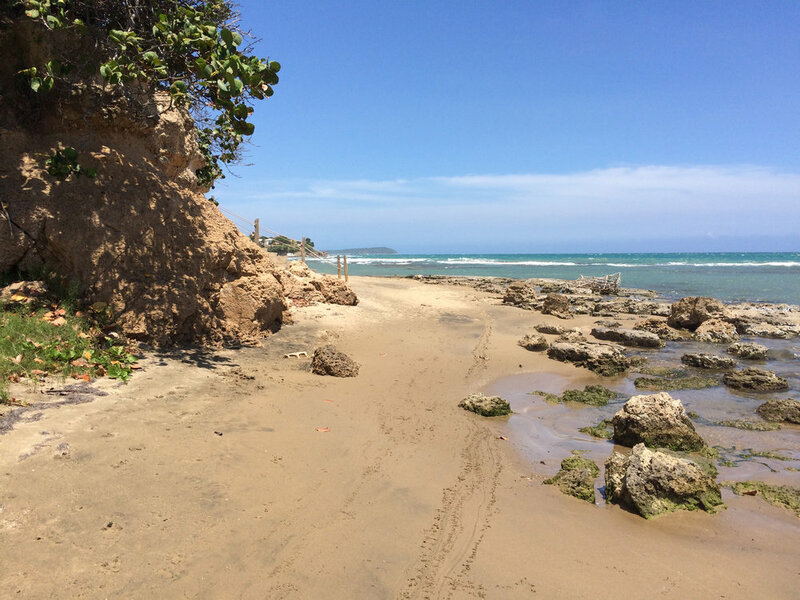 However, the trail to the beach has very soft sand and part of it is pretty steep until you reach the stairs. It's not difficult but anyone with trouble walking would not be able to make it. Staff: Ms. Ida, Ms. Monica, and Shepherd are all wonderful. It is a mother and her daughter and son. They become family within a day or two. Amenities: There's a washer and a clothes line, showers in each bathroom, a small tv that we never turned on, there's a stereo that has an ipod connection but my ipod nor my iphone worked with it. The local radio station is good though and the speakers are loud. The pool is much bigger than it looks in the pictures. The bedrooms have AC that is very cold. All windows and doors have screens. Shepherd keeps a stash of pool noodles :) Vendors: There were a total of three vendors that came by. The come in the mornings when someone from the staff is there. Ms. Monica or Ms. Ida will come and get you to see if you want to look at their crafts. The vendors are very friendly and appreciate you looking, even if you don't purchase. I bought something from each of them- Stanley was my favorite. He heard that I had regretted not buying one of his hand carved boats and walked over an hour to come back before I left. Airport transfer: I highly recommend Gairy Brooks. He lives in TB and you can book from his website. La Sirena is really an amazing place. The pictures do not do it justice. The locals are wonderful and we enjoyed venturing out and meeting them so much that we didn't really end up doing much else. There was a beach bon fire at the bottom of our stairs the last night that was put together by the owners of Irie Rest for their departing guests and we spent a very nice last evening enjoying the fire with them. Make sure you visit Shirley for a massage- she'll send a driver for you." "Let me start with a few words that come to mind: Awesome, amazing, relaxing, peaceful, beautiful...I could go on and on!! The Villa, Huge yet warm and welcoming and the staff (or should I say our new family members) were incredible! We shared great conversations and so many laughs with them. We never had a worry and the food...words can't describe how delicious every meal was. We ate so well that I took a picture of Miss Ida and Monica and told them it was for my treadmill to remind me why I was on it..lol! We enjoyed every walk on the beach picking shells and swimming in what seemed to be our own private beach. On that same beach, at the bottom of the villas stairway was a message in the sand to me from my boyfriend "Will you marry me?" Ummm Yesss!!! Thanks to Rebecca from Treasure Tours, Lance, Monica and Haley for assisting in my big surprise (sure wish Miss Ida could have been there, too). I want to mention Shepard since he kept us entertained each morning while keeping the pool sparkling clean. He also picked us 4 coconuts when our friends mentioned they had never tried it. We also had a great time walking around and stopping in stores/bars and visiting with the "neighbors". We spent 3 hrs at South Pole just at the end of the drive and also walked to Smurfs for a few drinks and never once felt uneasy or out of place, in fact, we received "hey mon's" and waves along the way, very cool. We slept like babies every night to the sound of the ocean, some nights for 10 hrs...crazy! 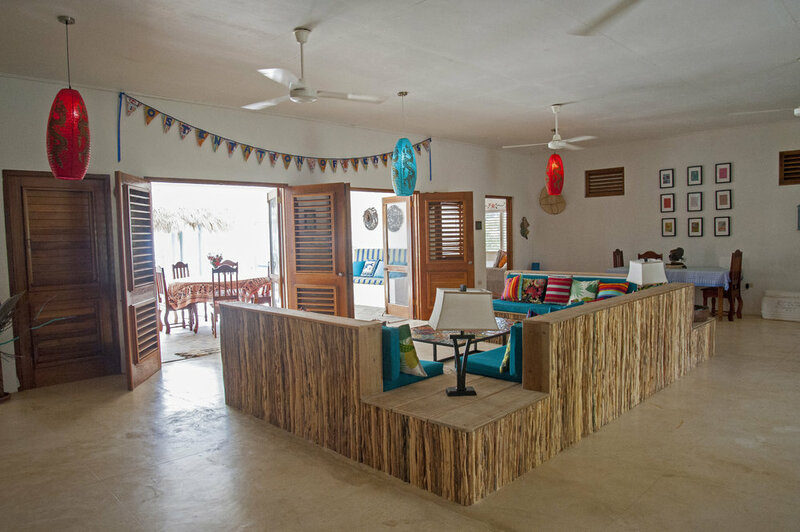 So that about sums it up, we enjoyed every bit of our stay at La Sirena and can't say enough about their warm, talented and down to earth staff. 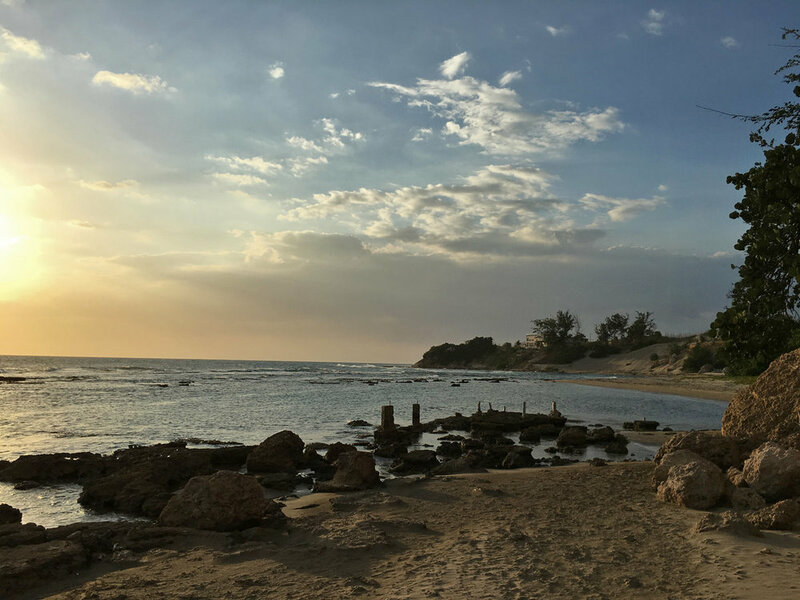 Also, a big Thank You to Rebecca and the Treasure tours team and to the residents of Treasure Beach for sharing their lives with us." "We had a fabulous time. Miss Ida, Monica and Shep were all wonderful. We would love to go back next year and will let you know as soon as we can if it will be plausible for us." "We felt very welcome from the minute we arrived and Ms. Ida (Mummy), Monica and Shepherd took great care of us for the duration of our stay. Collectively, they ensured that we were comfortable, without being obtrusive, and gave the impression that nothing was too much of an ask from them. The combination of a lovely villa, with good staff, makes for a great stay! Thank you." "We loved our week at La Sirena. We were two families with children ages 3-11. The pool is just steps from the living room and the beach is a short (2 minute?) walk from the house. The staff is very accommodating and kind. I'm ready to go back!" "We had a great time, and it was just what the kids needed after stressful years at school. They really just wanted to relax at the beach and pool, eat and sleep - lots of sleep! So we've decided Ida and Monica are national treasures (and Shepard was great as well). We loved the food and the great care they took care of us. I had told you we probably wouldn't have big breakfasts every day, but after having the first breakfast on Monday, we had to have them every day. There was so much good food for dinners that one night we told them to take the night off and we just used up leftovers. Ida was happy because it ended up being her bible study night, which meant she could go. We had a flat tire one day and they both rode up to the Texaco at Pedro Cross with my wife to get it patched. We found them (the people in Treasure Beach) to be such good people." "We had an incredible stay. Truly wonderful. Ida, Monica, Shenique and Shepard were just amazing. We all fell in love with them and their warm hospitality. What a wonderful family. The house was perfect. Kids loved it. Thank you so much for everything you set up for us. Really you went beyond the call and just made our holiday all the more memorable. We definitely going back to treasure beach." 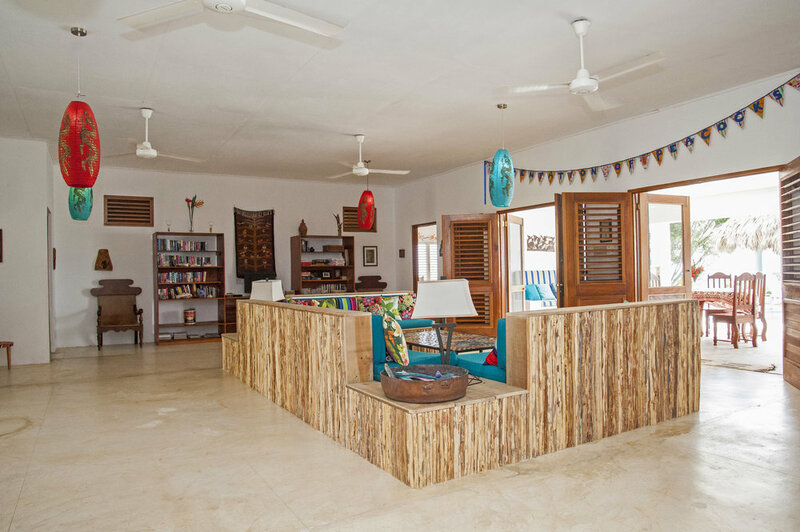 "La Sirena was a great place to spend time. The house was a great design and was nicer than we could have imagined.. I know the real reason thatwe had such a great time was that Miss Ida and Miss Monica are here to take care of us." "The most peaceful place I have ever been. We had such a fantastic honeymoon at La Sirena. We were isolated when we wanted to be and if ever we needed to be around people, they were only a phone call away. I have to also say though, it is so worth it to get to know Miss Ida, Miss Monica, Shepherd and Ukey. They are an amazing family with beautiful souls and they are all so different. This was a great place to start off our marriage and we look forward to returning. "I truly enjoyed my visit. This was my first trip to Jamaica and I will always remember this trip. I enjoyed Miss Ida and Miss Monica and the wonderful food they prepared. I will never stay at a resort when I return to Jamaica I will be back at La Sirena. Thanks for everything." 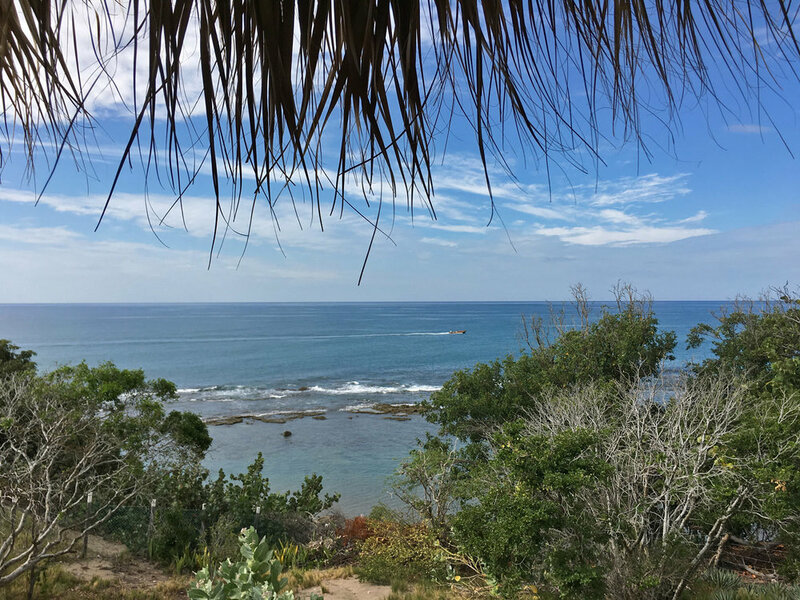 "We have had an absolutely lovely time here at La Sirena, This is our third time visiting Treasure Beach , and this is our favorite house by far. Miss Ida and Miss Monica are excellent cooks and such lovely people. Nothing I could write would convey what a wonderful time we’ve had. Thank you so much. We will surely return." "La Sirena- Salute to the energy of this place - clear wind, body and soul ." 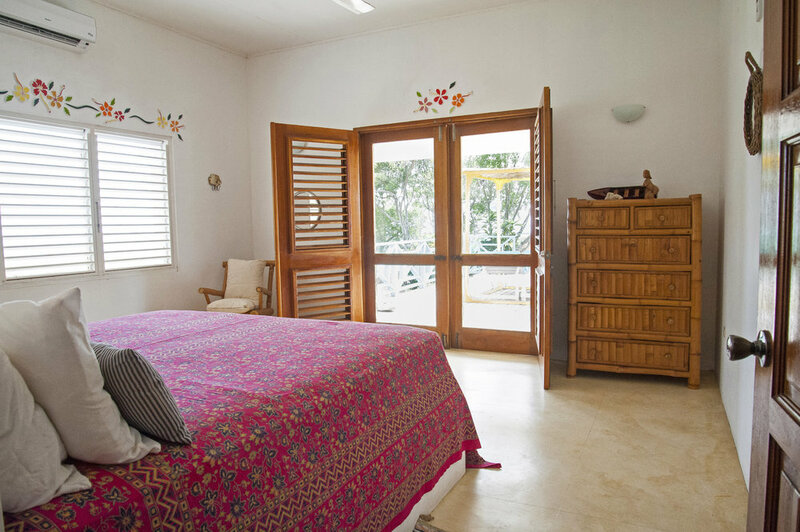 "We loved LA SIRENA -- the openness and airiness of the house is great. Miss Ida and Monica are fantastic -- very friendly and great cooks. They really made us feel at home." "THANKS a million for our wonderful stay in Jamaica. La Sirena was all you said and more. Miss Ida, Monica and Aman were amazing -- they are people of great wisdom and faith. Bless you for helping me with all this and making memories to last a lifetime."